Montana Hunter Advancement Program graduate George Cunningham shot a pronghorn outside of Ennis this fall. 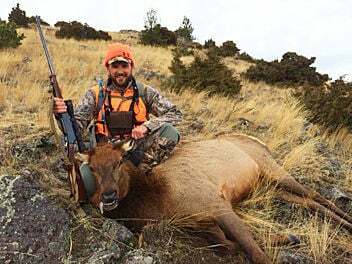 Graduate Scott Ogeka shot a cow elk in the Paradise Valley this fall. After successfully graduating its first class of master hunters in Bozeman last year, the Montana Hunter Advancement Program will expand with classes in Billings and Missoula this year. Even though she has 40-plus years of hunting experience, Billings resident Cheryl Davis took the course last year. "I think we can always learn," she said. "And I was really interested in the partnership between the landowners and the hunters." Bozeman legislator Zach Brown, one of the founders of the master hunter program, said the class was created to tackle the issue of the urban-rural divide that has developed between hunters and landowners. “What we have done … is put together a master’s degree for hunters,” he told a gathering of outdoor journalists this summer. By developing access agreements with landowners, the program will create graduates who Brown said landowners “can trust to make ethical decisions.” In return, hunters will gain access to private lands. “When you look at the Block Management (Program) rolls, the number one problem for landowners dropping out is poor hunter behavior,” Brown said of the state program that pays landowners to allow public hunting. The class is an outgrowth of a partnership of Montana landowners, outfitters and sportsmen who have been working together since 2010 to solve difficult issues concerning access and land stewardship in Montana through a nonprofit group named One Montana and its Common Ground program. Brown is a program manager for One Montana. Montana Fish, Wildlife and Parks launched a program in 2009 to increase hunters' understanding of landowner. The Hunter-Landowner Stewardship Program did not advance to incorporate hunting access to reward successful participants, however. The first class of 25 students graduated last year. Those students were chosen from 120 applicants. This year, in hopes of reducing the number of applicants who don’t meet the program’s guidelines, a $10 application fee is required. The application deadline is Feb. 18. The cost of the program is $200. Need-based scholarships are available. Program fees partially offset facility-use fees and other similar costs. Each participant has the opportunity to become a certified “Master Hunter,” receiving a Montana Master Hunter Certificate upon completion of the course. Each curriculum element includes either written, oral or field tests that assess student competence. The certification is valid for five years. Renewal will be available through additional in-person and online coursework and testing. The 50-hour course generally takes place over a six-week period. The program offers applicants an education in agriculture, conservation and stewardship, and specialized ballistics and marksmanship training. Instructors include ranchers, farmers, landowners, university faculty, professional shooting instructors, private land wildlife managers, wildlife biologists, first-aid personnel, as well as backcountry survival and equipment experts. “In hunting there are not a lot of opportunities to invest in your skill set,” Brown said. The class schedules are as follows. More detail is provided online at mtmasterhunter.com. Missoula: one evening each week on successive weeks beginning in March and one Saturday to be scheduled during April. Bozeman: five successive Saturdays beginning the first week of April. Billings: five successive Saturdays beginning the first week of May. All students will attend an end-of-session, two-day rendezvous in June during which shooting instruction and qualification will occur along with field work with OnX Maps and GPS. The program has garnered support from groups like the Rocky Mountain Elk Foundation, Boone & Crockett Club, Montana Stockgrowers Association and Montana Grain Growers Association.